The Twilight Series is a young adult fantasy romance series by author Stephenie Meyer. 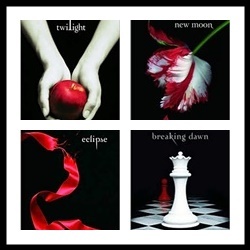 If you read much at all, I would be well and truly stunned if you hadn't heard of the Twilight Series. But for the sake of those who stumbled upon this page looking for a quick look into the series to learn what it's all about, here's my take. Twilight is about a high school girl named Bella who moves to Forks to live with her dad. She meets and falls in love with mysterious Edward Cullen, who she later finds out is a vampire. The chemistry between the characters is almost tangible, and the intensity of the story is out of this world! Even more, the descriptions of Forks and Bella's surroundings made it super easy to picture it all in my head as I devoured page after page. Stephenie Meyer is a good storyteller and despite how easy the books are to read and the quirky variety of vampire she created, I thoroughly enjoyed the series. Twilight is book one in the Twilight Series, and probably the best of all four books. Though I thought the finale might be my favorite before I read it... I stick with my choice that Twilight is the best of the books. Seventeen year old Bella Swan leaves behind her beloved Phoenix to move in with her father in Forks, Washington. A small, dreary town where nothing exciting ever happens. On her first day of school she has an encounter with the mysterious and incredibly gorgeous Edward Cullen, and though it was less than savory, she can't stop her curiosity from getting the best of her. For me, it's all the little things that make Twilight such a special book. 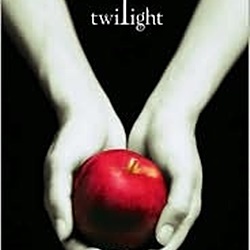 There is an intensity that a lot of other books I've read in this genre seem to lack, and the connection between Edward and Bella is sizzling. While she is shy and thinks she's average, he sees something completely and utterly different in her than he has ever seen in anyone. Just being near Edward has an incredibly powerful affect on Bella. A lot of times the way he smells and the heady feeling she gets when she's with him makes her a bit incoherent. It is a bit funny that the vampires in this story sparkle, and they can be out in the sun and feed on only animals... but it's unique and it's an entertaining story to read. For lovers for the movie, who haven't yet given the books a chance, the books are ALWAYS better. I know you've been told that before so don't be stubborn. ;-) Seriously... if you enjoyed the movie, read the books. You won't regret it. Many of those small but significant moments that I mentioned make Twilight so special aren't really portrayed in the movie (or couldn't be), but they really make the book that much better. The sweet moments Bella and Edward share when no one else is around makes this a true teen romance with supernatural elements, but it's an enjoyable read for anyone who enjoys a good story. 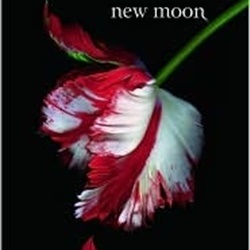 In New Moon Edward decides that the only way to keep Bella safe is to leave her. Without so much as a warning and barely a goodbye, Edward and the Cullens leave Forks with a promise never to return. And after the heart-wrenching departure of her only love, Bella is devastated. She's in pieces without him and in more danger than ever. Vicious Victoria is back and looking to avenge the death of her mate-James, whom the Cullens killed in Twilight. And she'll stop at nothing to leave Edward without his love. Bella and Jacob develop a much closer friendship in Edward's absence. I do like that she has him to rely on. But now he and the werewolves are risking their lives to protect her. There was a good amount of suspense and bits of action that somewhat made up for the lack of the Cullens. And meeting the Volturri in the end was definitely an interesting experience. However, Bella's broken soul and reckless behavior tore at my heart. She was desperate to hold on to the only thing left of Edward she had- her memories. It was an intensely emotional volume, but still worthy of a good read or two. For me, this is the Twilight book that has the best action. The Cullens stand up and fight for to protect Bella as one of their own and Victoria finally gets what's coming to her. After a heart-wrenching departure in New Moon, the Cullens have returned to Forks and Edward has finally realized that keeping Bella at a distance only puts her in more danger than ever. Recent news has reported a string of mysterious attacks in Seattle that lead the Cullens to believe that someone is creating newborn vampires and letting them loose on the streets to wreak havoc on the human population. But who is it and why are they drawing such attention to themselves? Victoria is still at large and more determined than ever to get at Bella. While they work to keep Bella safe and get to the bottom of all the newly created vampires wreaking havoc in Seattle, Carlisle sees no other way but to bring the wolves into the inner circle and trust them to keep their territory safe. With all the new vampires popping up, there's a surge of new wolves to keep the balance. Since their job is to protect their territory from threats, they are ever so ready to join the Cullens in taking out the trash being dragged into their town. Bella struggles more than ever between her friendship with werewolf, Jacob Black and her soul deep love for vampire, Edward Cullen, and the tension that had been building since New Moon finally comes to a head. The three of them end up together on top of a freezing mountain where some irritating things happen and the three of them are forced to hold close quarters together for Bella's well being. 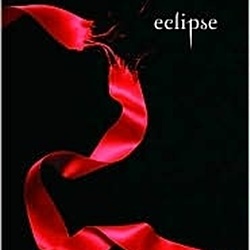 The suspense and action in Eclipse make for a really exciting read. Bella finally agrees to marry Edward, they finally get rid of Victoria and now that they've dealt with the threat of the newborn vampire army the only thing left to worry about is the Volturri... until Bella becomes a vampire. 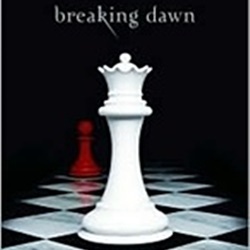 Though the Twilight book still holds the number one spot on my list of favorites for this series, Breaking Dawn is a close second. There is so much I enjoyed about this book. I was hooked from the first few pages, and, despite it's length, I devoured it within about a day and a half. The story is split into three parts. The first part and the third part are written in Bella's point of view, the second in Jacob Black's. Since I'm 100% TEAM EDWARD, I would have enjoyed the second part of the book in his perspective, but it was good nonetheless. Part one focuses on Bella and Edward's wedding and honeymoon. Meyer described the wedding so well I could actually picture it in my head. Even with the potentially disastrous little dance Bella shared with a certain hot tempered wolf, everything worked out the way I had hoped it would. The honeymoon was tastefully written. I know there have been plenty of comments regarding the sexual content in the book because it's written for a young adult audience, however, I don't feel it is explicit in any way and it was appropriately written for the young readers it was targeted to. Seriously people- not only are they married now, but this book could hardly be called explicit (in any way). Now that I've said my piece let's get down to business. It was difficult to really get into part two of the book. I thought Jacob's character was kind of whiney and childish, and I was disappointed in the fact that it was from his point of view rather than Edward's. I think it would have been much more interesting to open the story up to the thoughts of everyone around them through Edward. I did enjoy the constant tension between Jacob and Rosalie, there were some pretty funny moments shared between them that had me belly laughing. The "Fido" bowl was one of my favorite moments from the book. In part three Bella learns what it's like to truly become a Cullen- in every sense of the word. Learning to hunt and drinking animal blood, getting accustomed to having incredibly heightened senses, and the surprisingly insatiable appetite she has for Edward. For me, this was the most enjoyable part of the story. The suspense is brutal. It started building from the moment Bella opened her eyes as a newborn and lasted through Alice's unexpected vision and into the final moments of the book, when the Volturri decide the fate of the Cullens, their friends and their extended family. I highly recommend Breaking Dawn and the rest of the Twilight Series to teen and adult readers who enjoy a good vampire fantasy.